Anyone who has been in BMX long enough is well aware of who Dave Harrison is. I doubt too many people would doubt his reputation as being one of the best welders in BMX either. Over the last year, he has been busy getting his own welding company called Pedal Driven Cycles dialed in and it looks like things are finally on the move. Today he announced that they will be releasing a limited run of their first frame called “Kool Thing”. This American made (clearly) frame has a 74.5-degree head tube angle, 71-degree seat tube angle, 11.75″ bottom bracket height, 9″ seat tube height and a 13.75″ chain stay length. You can find features like the Stainless steel Pedal Driven Cycles head tube and down tube badges (that are individually marked for each one of the 50 frames being released), Shark Fin technology in the bottom bracket, a top tube gusset with “TCB” laser cut out, which stands for “Taking Care of Business”, 3/16″ heat-treated drop outs and removable brake mounts. 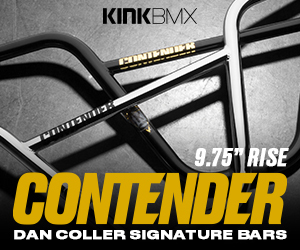 The Kool thing will be available 20.75″ and 21″ top tube lengths with raw or black for the colors. You can pre-order one of these frames for $380.00 right here or have your local shop hit up Pedal Driven Cycles to get one ordered up today. Remember, there’s only 50 of these being released so get on it now if you want one. You can check out more photos and find out what Shark Fin Technology is by clicking here.